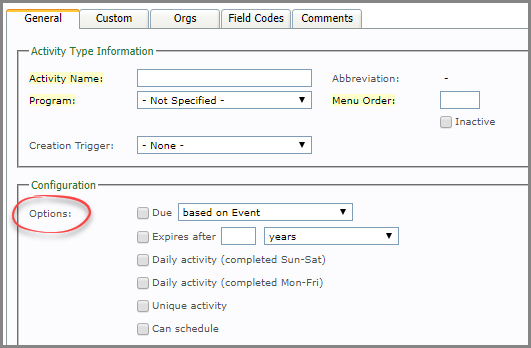 This article is meant to provide you with details in configuring Expiration Dates for Activity Types and Report Types. If you have a question not addressed here, you can search at the bottom of this article in Related Topics or you can Contact Support. Expiration dates track when a recorded event, document, or training needs to be performed again or an updated version collected. If you have a Due Date for an Activity Type or Report Type, you cannot have an Expiration Date as well. • Driver’s License – When you upload a scanned copy of a driver’s license, you are able to track when a new one needs to be collected, based on the date you record from the license. • Training – When recording a CPR First Aid Training that expires in 2 years, for example, you would enter the training date into extendedReach and extendedReach will calculate the 2 year expiration date. • TB Test – When recording a TB Test that needs to be performed again in 5 years, for example, eR will calculate the 5 year expiration date. Expiration Dates appear on each worker’s task list, similar to a “Due” item. The Expiration Date is updated by adding a new version of the same activity type or report type. Only the latest Expiration Date is tracked for each activity type or report type. From an Activity Type or Report Type, click on the General tab, and scroll down to the “Configuration” field, to access “Options”. The second check-box option is for Expiration Dates. Check “Expires after” and then select the point at which you want this Activity Type or Report Type to expire. User-specified dates for are typically entered for documents such as driver’s license, car registration, or when the expiration date varies. For example – Some first aid training is good for 2-years while others may be good for 3-years.